August 21st, 2008: Cloudy and warm, Water Temp 84* and Clear. Picked the guys up and went and caught bait. Bait collection took a couple of hours this morning and we got started fishing at 7:15. I hit an area where fish were and popped a keeper Striper that looked like a pencil, it was so skinny. We worked similar patterns getting a few hits but the fish just did not want to eat. I can't figure out if it was the clouds and a small front moving through or just missing the major feed or what but they would not eat this morning. 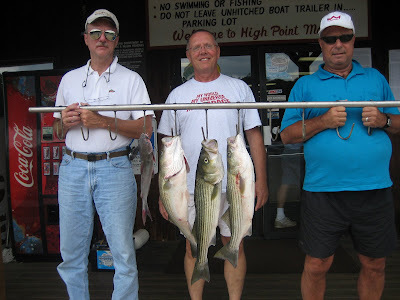 The guys are pictured holding a few that we did catch.